One of my favorite go-to meals! 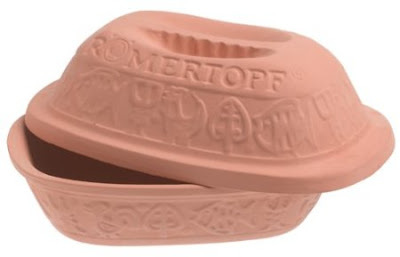 This little clay pot is awesome! If you want to make rotisserie worthy chicken at home, then I highly recommend investing in one of these pots. It is so easy to use and the results are amazing - you will never have dry chicken when baking with one of these pots. Wash the chicken. Make sure to remove the giblets! Pull the skin away from the chicken. Cut butter into small cubes and place between the skin and body of the chicken. Squeeze lemon juice onto the chicken. Rub salt and pepper over the entire chicken. Place sprigs of fresh herbs in pot. Place carrots and potatoes around the chicken. Put the lid on the clay pot. Bake at 400 degrees for about an hour and a half. OPTIONAL: While baking, mix honey and soy sauce together. Pour honey soy mixture over chicken about halfway through baking time. When it is done, the chicken will be golden brown on the outside and juicy inside. Yummy! Don't throw away your carcass! After eating your chicken, save any extra meat for other meals and save the carcass (bones, cartilage, etc.) for homemade chicken broth. I will post how to do this easily overnight in a crock pot soon! Does anyone already use a clay pot and have any other good recipes to share?